The 390 Grand Large presents the next generation of Dufour Grand Large hulls.The signature of Umberto Felci, with the recent innovations inspired from the Dufour Exclusive range, is distinguished by the bulwarks integration and the magnificent hull recess. Furthermore, the important front volume and modern aft shines lines make this hull more spacious and performant. The research that is at the base of the new Dufour 390 Grand Large hull has led to optimizing the ratio between the maximum navigation efficiency and the need to offer ever greater and better exploitable interior volumes. The new hull, wide and flat, which finds its maximum expression downwind, is however very performing even upwind, thanks above all to the new “stern to bow” hull volumes development. 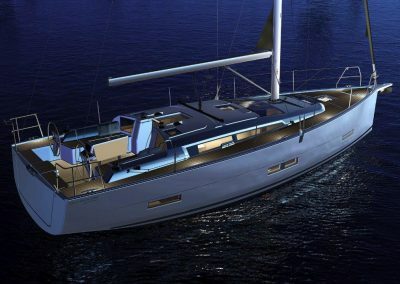 The new deck design is a prowess of balance between stunning aesthetic, correct dimension of each area and ingeniosity to integrate new functions.The roof proportions have evolved in comparison with Grand Large predecessors and now offer more interior space while conserving pleasant sidedeck width, as distinction value of Dufour sail yachts. The D390 shows a consistent evolution of her standard equipments. Among the novelties, we distinguish the elegant pod consoles, the sublime ladder integrated in the aft platform, the double batten companion way and the led dressing all around the deck. The Dufour 390 benefits from all the Dufour Yacht know-how in terms of interior layouts and finishing. It integers a solid and functional furnitures. The cabins and heads are spacious and dressed with top quality materials. The standard configuration has been highly upgraded with USB plugs, led lights and various accessories, as well as equipments, as shown by the capacity of the water-boiler, increased from 20L to 40L. 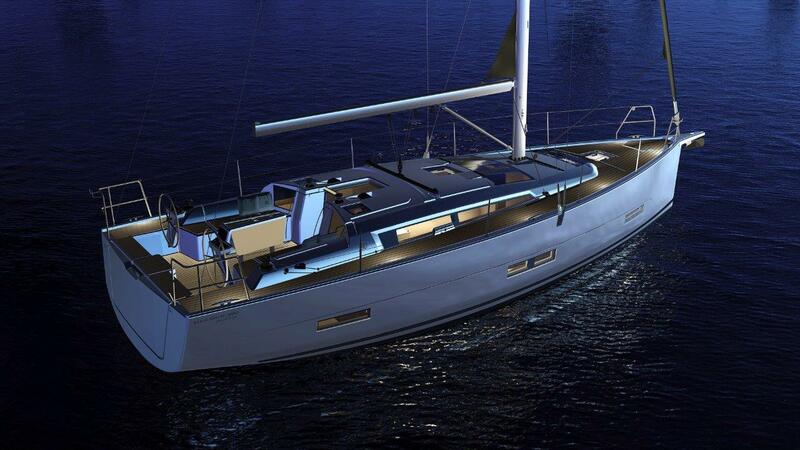 The Dufour 390 is proposed in 3 layout versions and 3 woods, Moabi, Oak and Teak.